Home / Electrical / What is MCB (Miniature Circuit Breaker), its Construction, Working, Types & How to select proper MCB for different loads rating? 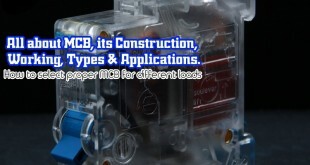 What is MCB (Miniature Circuit Breaker), its Construction, Working, Types & How to select proper MCB for different loads rating? All fuses need to be replaced when they have operated. Unlike a fuse, an MCB operates as automatic switch that opens in the event of excessive current flowing through the circuit and once the circuit returns to normal, it can be reclosed without any manual replacement. MCBs are used primarily as an alternative to the fuse switch in most of the circuits. A wide variety of MCBs have been in use nowadays with breaking capacity of 10KA to 16 KA, in all areas of domestic, commercial and industrial applications as a reliable means of protection. What is Miniature Circuit Breaker (MCB)? An MCB or miniature circuit breaker is an electromagnetic device that embodies complete enclosure in a molded insulating material. The main function of an MCB is to switch the circuit, i.e., to open the circuit (which has been connected to it) automatically when the current passing through it (MCB) exceeds the value for which it is set. It can be manually switched ON and OFF as similar to normal switch if necessary. MCBs are of time delay tripping devices, to which the magnitude of overcurrent controls the operating time. This means, these get operated whenever overload exist long enough to create a danger to the circuit being protected. Therefore, MCBs doesn’t respond to transient loads such as switches surges and motor starting currents. Generally, these are designed to operate at less than 2.5 milliseconds during short circuit faults and 2 seconds to 2 minutes in case of overloads (depending on the level of current). A typical external appearance of an MCB is shown in figure. MCBs are manufactured in different pole versions such as single, double, triple and four pole structures with different fault current levels. Mostly, MCBs are linked to give two and three-pole versions such that a fault in one line will break the complete circuit and hence complete circuit isolation are provided. This feature will be helpful in case of single phasing in three phase motor protection. These are rated at 220V for DC supply and 240/415 for AC supply (single and three-phase) with different short circuit current capacity. Typically, single phase devices have load current range of up to 100 A. Some MCBs have facility to adjust its tripping current capacity while some devices are fixed for some load current and short circuit rating. MCBs are used to perform many functions such as local control switches, isolating switches against faults and overload protection devices for installations or specific equipments or appliances. An MCB embodies complete enclosure in a moulded insulating material. This provides mechanically strong and insulated housing. The switching system consists of a fixed and a moving contact to which incoming and outgoing wires are connected. The metal or current carrying parts are made up of electrolytic copper or silver alloy depending on the rating of the circuit breaker. As the contacts are separated in the event of an overload or short circuit situation, an electric arc is formed. All modern MCBs are designed to handle arc interruption process where arc energy extraction and its cooling are provided by metallic arc splitter plates. These plates are held in a proper position by an insulating material. Also, arc runner is provided to force the arc that is produced between the main contacts. The operating mechanism consists of both magnetic tripping and thermal tripping arrangements. The magnetic tripping arrangement essentially consists of a composite magnetic system that has a spring loaded dashpot with a magnetic slug in a silicon fluid, and a normal magnetic trip. A current carrying coil in the trip arrangement moves the slug against spring towards fixed pole piece. So the magnetic pull is developed on the trip liver when there is a sufficient magnetic field produced by the coil. In case of short circuits or heavy overloads, strong magnetic field produced by the coils (Solenoid) is sufficient to attract the armature of trip liver irrespective of the position of slug in the dashpot. The thermal tripping arrangement consists of a bimetallic strip around which a heater coil is wounded to create heat depending on the flow of current. The heater design can be either direct where current is passed through bimetal strip which effect part of electric circuit or indirect where a coil of current carrying conductor is wound around the bimetallic strip. The deflection of bimetallic strip activates the tripping mechanism in case of certain overload conditions. The bimetal strips are made up of two different metals, usually brass and steel. These metals are riveted and welded along their length. These are so designed such that they will not heat the strip to the tripping point for normal currents, but if the current is increased beyond rated value, strip is warmed, bent and trips the latch. Bimetallic strips are chosen to provide particular time delays under certain overloads. Under normal working conditions, MCB operates as a switch (manual one) to make the circuit ON or OFF. Under overload or short circuit condition, it automatically operates or trips so that current interruption takes place in the load circuit. The visual indication of this trip can be observed by automatic movement of the operating knob to OFF position. This automatic operation MCB can be obtained in two ways as we have seen in MCB construction; those are magnetic tripping and thermal tripping. Under overload condition, the current through the bimetal causes to raise the temperature of it. The heat generated within the bimetal itself enough to cause deflection due to thermal expansion of metals. This deflection further releases the trip latch and hence contacts get separated. In some MCBs, magnetic field generated by the coil causes develop pull on bimetal such that it deflection activates the tripping mechanism. Under short circuit or heavy overload conditions, magnetic tripping arrangement comes into the picture. Under normal working condition, the slug is held in a position by light spring because magnetic field generated by the coil is not sufficient to attract the latch. When a fault current flows, the magnetic field generated by the coil is sufficient to overcome the spring force holding slug in position. And hence slug moves and then actuate the tripping mechanism. A combination of both magnetic and thermal tripping mechanisms are implemented in most of MCBs. In both magnetic and thermal tripping operations, an arc is formed when the contacts start separating. This arc is then forced into arc splitter plates via arc runner. These arc splitter plates are also called arc chutes where arc is formed into a series of arcs and at the same time energy extracted and cools it. Hence this arrangement achieves the arc extinction. The above three types of MCBs provide protection within one tenth of a sec. The minimum and maximum trip currents of these MCBs are given in a tablular form below, where Ir is the rated current of the MCB. MCBs can also be classified based on number of poles such as single pole, double pole, triple pole and four pole MCBs. How to Select Proper MCB for different loads? If it is undersized (MCB rating less than the nominal load current), MCB causes frequent tripping and causes to interrupt the current to the load it is being connected, because the MCB nominal current less than nominal current value of the load. Similarly, if it is oversized (MCB rating more than the nominal load current), the load to it is connected will not be protected efficiently. In such case, the MCB will not trip even though load is drawing overcurrents. The following are the three factors to be considered for selecting an MCB for specific application. This rating refers to the capability of MCB that can trip or interrupt the circuit under short circuit conditions. It is expressed in Kilo Amps (KA). This rating must not be less than the prospective short-circuit current. The prospective short-circuit current the maximum current that exist in the circuit during short-circuit conditions. In residential installations 6KA MCB is sufficient while 10 KA or above rating MCB is needed for commercial and light industrial applications. The type of MCB needed for a specific application decided by operating characteristics such that various current ratings are required to operate the loads instantaneously. We have already mentioned various types of MCBs for different applications above.